Remember when no one had heard of coconut oil? Those days are long gone, thankfully. We’re crazy about coconut oil around here. And today and tomorrow, you can get a 24% discount on a 16-ounce package of our favorite coconut oil, Viva Labs organic extra virgin coconut oil, our latest sponsor. Simply click on this link on Amazon (Viva Labs Organic Extra Virgin Coconut Oil) and enter the promo code GFGPROMO. You’ll receive 24% off your purchase. Of course, coconut oil is great in curries, since it complements all the flavors of ginger, turmeric, cumin, and garlic so well. (I love this Madhur Jaffrey lentil curry, but I use coconut oil in place of the canola oil.) But it’s also great as the oil for popping popcorn. Once I popped corn with coconut oil, I’ve never used another fat for it. (Try that popcorn with finely chopped fresh rosmary, a tiny of bit of lavender, and sea salt.) A friend of mine insists that her sweet tooth is sated by sucking on frozen coconut oil (it actually tastes like white chocolate); she puts it in ice cube trays so she can have a couple a day for a week. Some folks use coconut oil as a moisturizer, a shaving cream, and a topical ointment for other beauty and medical concerns. My favorite use for coconut oil? Making gluten-free cakes. We’re going to start telling you more and more about our upcoming cookbook, Gluten-Free Girl: American Classics Reinvented , starting on the 4th of July. But I’ll give you a sneak peek: coconut oil is much better than butter in gluten-free cakes. Its lovely buttery texture makes those cakes delicious and fluffy. You’ll want to stock up on coconut oil soon. However, not all coconut oil is the same. Some taste flat. Some taste a little cheap. And some taste rancid. You don’t want that. This is why Viva Labs Organic Extra Virgin Coconut Oil is our latest sponsor. This is our very favorite coconut oil. 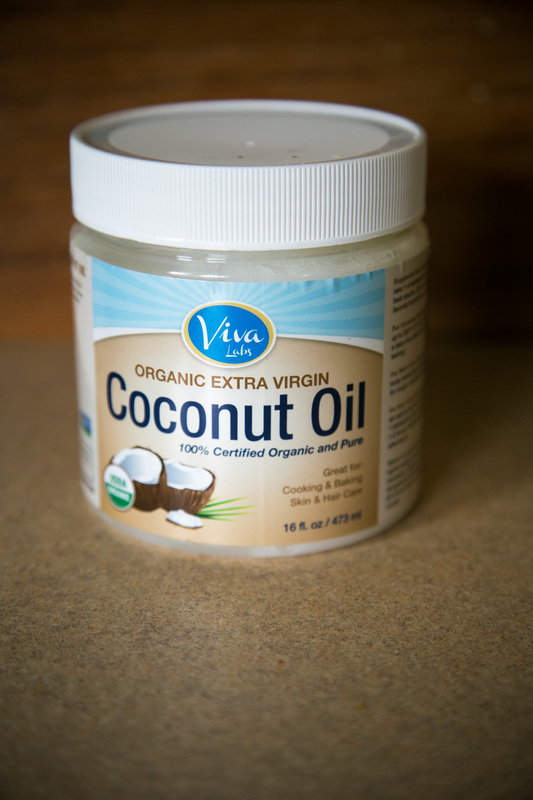 The coconut oil from Viva Labs is organic and cold-pressed to maintain its quality. It has no bleach, deodorizers, or secret ingredients. And it tastes richly of coconut oil. So many gluten-free folks find they have to be dairy-free as well. Viva Labs Organic Extra Virgin Coconut Oil is a gift for those who have to be dairy-free. We use it all the time and we don’t miss the butter when we do. Today and tomorrow, Viva Labs is offering a 24% discount on their 16-ounce package of coconut oil for readers of this site. Simply click on this link on Amazon (Viva Labs Organic Extra Virgin Coconut Oil ) and enter the promo code GFGPROMO. You’ll receive 24% off your purchase. This offer is only good through Monday evening so act now! Great gluten-free cake awaits you. Not to mention, it’s great for dry skin! I just ordered it – thank you! Shauna, I’m sure you mean well but the “Bulletproof coffee” claim has zero medical research to back it up. It is based solely on extremely limited (one person) anecdotal evidence. Please do not use information like this to promote your sponsors. Thank you. Dennis, I was merely quoting what Paula Wolfert said, which intrigued me. We all make up our own minds about our health. Then you should have made this disclaimer in your post. Your quotation is within the context of the benefits you’re listing, which suggests that you not only support the misinformation, but that you endorse it. This is exactly what I was getting at. I make up my mind about my health based on as much scientific information I can gather from trusted sources. You are trying to sell people on your sponsor’s product and you have implied that it might help Alzheimer’s patients, apparently without verifying whether there’s any truth to this. That’s disingenuous at best. As a dietary fat, coconut oil is a pretty good choice, with medium-chain fatty acids which don’t raise serum low-density lipoprotein (LDL) cholesterol the way long chain fatty acids do. But it’s still 117 cals per tablespoon–I don’t know that I’d be adding a couple of tablespoons of saturated fat per day to my diet. No worse than eating some avocados or nuts on a daily basis, which many people do to get essential nutrients and fatty acids in their diet. Just use common sense, if you are going to add some calories subtract some others, preferably from your processed food junk list. This comment seems a little mean, to be totally honest. Why do you assume that people are eating processed foods instead of “bulletproof coffee?” And you do realize, right, that some processed foods aren’t horrible for you and a necessity for people who are balancing work and other obligations? Sometimes Shauna even endorses processed foods on her “Meet Our Sponsors” page. I understand trying to eat well. But you won’t get anybody to agree with you if you are condescending. No one said “don’t eat processed food”, simply trim some calories from less healthy food (which, let’s face it, we all eat from time to time) in order to make room for healthier options. Coconut oil is really great stuff. I am ordering it now for my family.